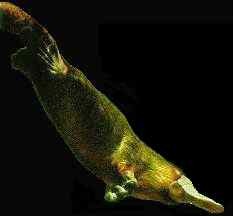 God made all the animals including the duckbill platypus. The platypus is a small furry little animal that loves the water (it's aquatic). The platypus lives near fresh water where it finds its food and makes its home. The males have poison like a snake in spurs on their hind legs. The poison can kill a dog and cause extreme pain in people. They have a bill like a duck. They have a tail like a beaver. They have webbed feet like a duck. The mother's milk comes out through glands on her skin and the babies lick it off of her fur. The platypus is only found in Australia and its island state, Tasmania. The platypus lives a solitary life in and around fresh water spending about 12 hours a day swimming and searching for food in the water. They have voracious appetites and can eat their own body weight in food in one night! 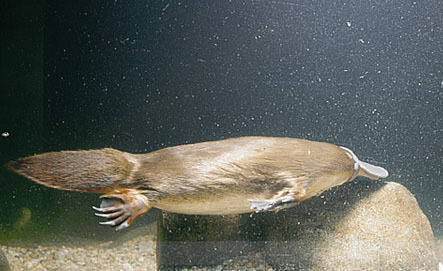 The platypus can remain submerged up to 2 or 3 minutes at a time. Since its nostrils are on top of its bill, it can breath as it swims on top of the water. If you want to see a good picture of a platypus swimming, click here. The platypus likes to eat worms, slugs, shrimp, larvae, eggs and yappies. 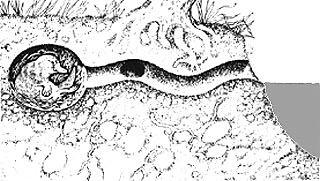 It lives in burrows that it digs under the ground near water. The burrow can be up to 20 yards (60 feet) long! The mother platypus lays two eggs and keeps them warm by placing them on her belly and covering them with her tail. In about two weeks they are born. The baby platypi are naked and helpless. They drink their milk off of their mother's fur for four to five months. When she goes to get food they stay in the comfort of the burrow. The platypus can live up to 17 years in captivity. It has dark brown fur on its back and silvery to light brown hair on its belly. It can grow up to two feet long including its tail. It is a shy little animal that keeps to itself. God takes care of the platypus.